The bathroom, often neglected in terms of lighting with many people opting for a single ceiling light with the expectation that it will provide all necessary illumination. Either that or without choice you’ve been left with that singular central bulb from the previous house owner! For some people the single bathroom ceiling light may be adequate if you do not require the appropriate lighting for doing make up or shaving in front of the mirror, though most people do or wish to create a better and more relaxing mood with an array of ambient light. Read on to find out how with helpful information on bathroom lights! First of all it is wise to consider the design of the bathroom before choosing your bathroom lights. If it has a number of mirrors, is shine tiled or generally brightly coloured then the amount of light required will be less for general lighting – this is of course due to the fact light will be reflected easier around the room. If this is the case and your bathroom is small in size a bathroom wall light or over mirror light may well be enough for you. If you find your bathroom is larger and requires more light then partnering a ceiling light with a wall and or over mirror light may be worth considering. The style of your bathroom will also play a big part in the decision of your bathroom lighting, for example you would not likely want to place modern chrome bathroom lights into a rustic Victorian style bathroom… Would you? If you have a modern style bathroom then the usual trend is to opt for chrome bathroom lights as these tend to fit in well matching most taps. We have a good selection of chrome ceiling lights for bathrooms and chrome wall lights for bathrooms to choose from, as well as a selection of traditional bathroom lighting. Continuing with the modern style in mind you may be interested in bathroom spotlights, these not only look great fitting the part but are also practical if you have a low ceiling bathroom due to their recessed features. As previously mentioned you may wish to use a mirror to do make up and other practical tasks, a common mistake made here is to put a downward spotlight in front of the mirror. This is not the ideal lighting for this task as it can cast shadows on your face making some things far more difficult than they should be! An illuminated bathroom mirror may be a wise addition here. Of course many people tend to envision spotlights as the only style of bathroom lighting but that simply is not the case, there are many alternatives on offer from “candle styled” traditional bathroom wall lights to that touch of class with bathroom rated chandeliers. A good option to think about is also the use of LED bathroom lighting, LED lights are great for modern bathrooms. They’re cost effective and can provide a very modern effect with the option of alternative colours to the usual warm and cool whites. 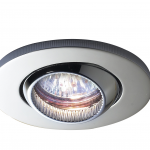 LED spotlights are a better choice to the usual halogen spotlights if you want to keep the running cost down. If you have any steps in your bathroom then a ground light may be a good idea, LED bathroom lights are great for this and these are very modern additions. What makes safe bathroom lighting? IP44 lights are required for bathrooms, wet rooms and en suits too, IP stands for “Ingress Protection” and the two characters after refer to the level of protection they provide. It is very important that you choose the correct rating in accordance with where they will be situated in the bathroom. There are defining areas in the bathroom which can require certain levels of protection, these are called “zones”. There are 4 in total named “zone 0, 1, 2 and 3”, below is a description of what these zones are and what rating they require. Zone 0: This zone is inside the bath or shower itself. The fittings used in this area must be low voltage (a maximum of 12V) and have a rating of at least IP67 which is immersion proof. These features will be required for a fixture to be classed as bath or shower proof lights. Zone 1: This is the area above the bath to a hight of 2.25 meters from the floor. A rating of at least IP44 is required here to be considered as splash proof lights for bathrooms. 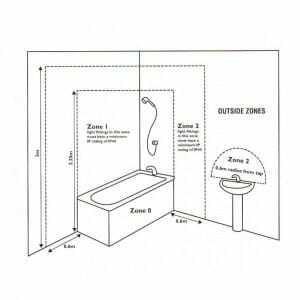 Zone 2: This is the area stretching 0.6 meters outside the perimeter of the bath and also to a height of 2.25 meters from the floor. In this zone a rating of IP44 is also required. In addition it is good to consider the area around a sink within a 60cm radius of any tap as “zone 2”. Zone 3: This is the area anywhere outside of the other zones. An IP44 bathroom light rating is not essential but is recommended if you have small children who are likely to splash away in the bath! Or simply for your own peace of mind, after all there are many eye pleasing bathroom rated lights to chose from. 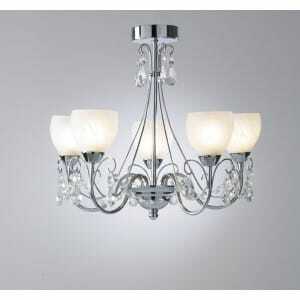 If you want an extravagant fixture but still want it bathroom rated there are ones available! Take a look at our bathroom rated chandeliers for examples. On the subject of safety some bathroom lights will have a pull cord switch in order to operate them such as over mirror lights or wall lights, but with most main lights you will have a switch just outside your bathroom to keep it away from moisture. If you want total control over your bathroom lighting it is advised that you fit them with a dimmer switch if possible rather than the simple two way, you wouldn’t want to be dazzled in the early hours of the morning. We at The Lighting Company have a great selection of dimmable bathroom lights on offer. Dimmable bathroom lights are great mood suiting lights, the bathroom is where you will start your day and end it so having the option to “quieten” the room is important. Does your bathroom have no windows? Check out our other bathroom related blog here: How do you light a bathroom that has no windows? ← Previous Previous post: Lighting UK the best of British! Next → Next post: Hotel Lighting create a boutique style bedroom.